That’s the Middle Creek Builder’s Tradition! We offer over 40 years’ experience specializing in custom home building and quality home renovations. Our goal is to build truly unique homes that far exceed the homeowner’s expectations. Middle Creek Builders is a family-owned and operated business, founded in 1974 by Walter Bollinger Jr. Since the beginning, Walter focused on quality custom home construction, tailoring his business to meet the unique needs of his customers. Not surprisingly, his hands-on approach and dedication to quality soon earned him a solid reputation in the industry. In 1974, Walter opened Middle Creek Builders for business. 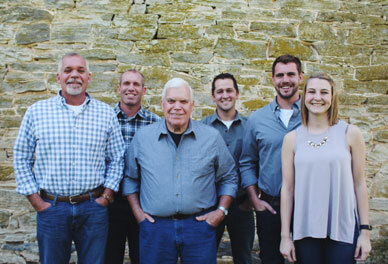 In 1990, Middle Creek Builders incorporated, and Walter’s son Darryl joined the business. In 2008, Walter’s son, Duane, also joined in the family business. Together, the trio has continued the tradition of providing quality hands-on service to their customers and added custom renovations to their growing list of services. In 2012, Dalton, Walter’s eldest grandson, became employed fulltime creating a third generation of Bollingers to follow in the family business! Today, over 80 percent of Middle Creek Builders’ business comes from referrals – satisfied customers who have recommended our services to their family and friends. Our experience combined with an impressive list of quality sub-contractors allows Middle Creek Builders to continue to help homeowners re-invent their homes and build their dreams!